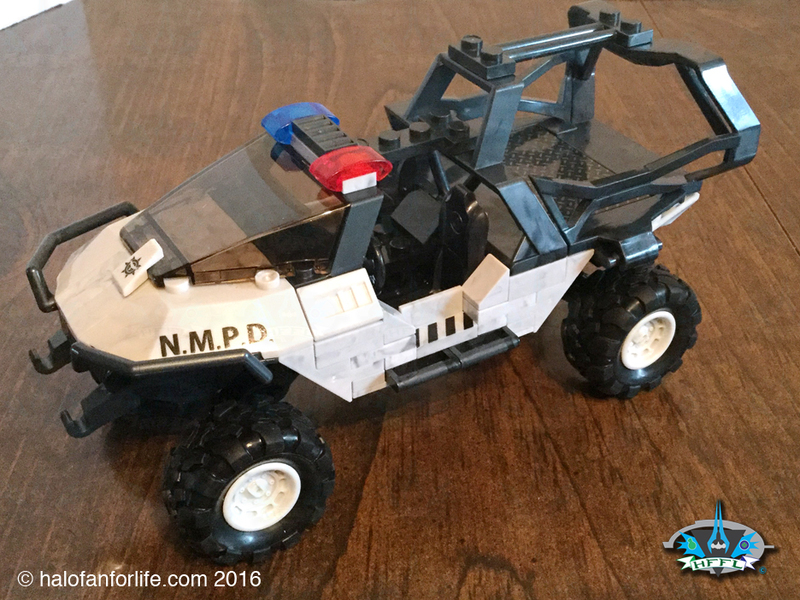 Special Features: Wheels spin, independent suspension, steering wheel turns, outward pivoting side troop cage bars. Cost: $17-30 It IS a Wal*Mart exclusive. However, while WM may sell it for around $27-30, I was able to get this on Walmart.com through a third party seller for $17 and no shipping. This set is pretty hard to find as of this writing, so get it when you see it if you are wanting it! The packaging art is well done per usual with Mega Bloks. The figures are prominently shown in the window on the front of the box. The back of the box shows them again and gives a title to each figure. Here are the contents of the box. 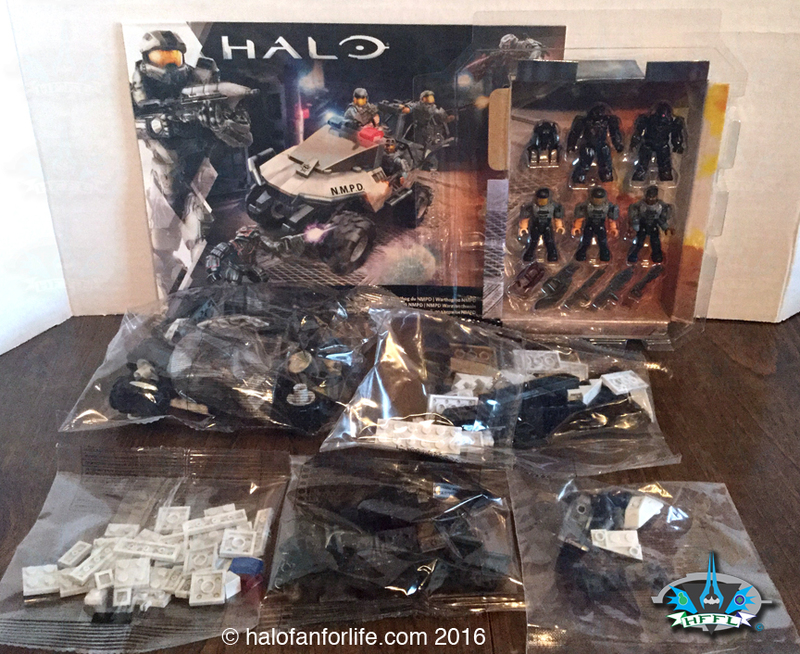 You get six bags of pieces and the figure tray. Speaking of the figure tray, here it is up close and without the cardboard backing. The pieces all sorted out. 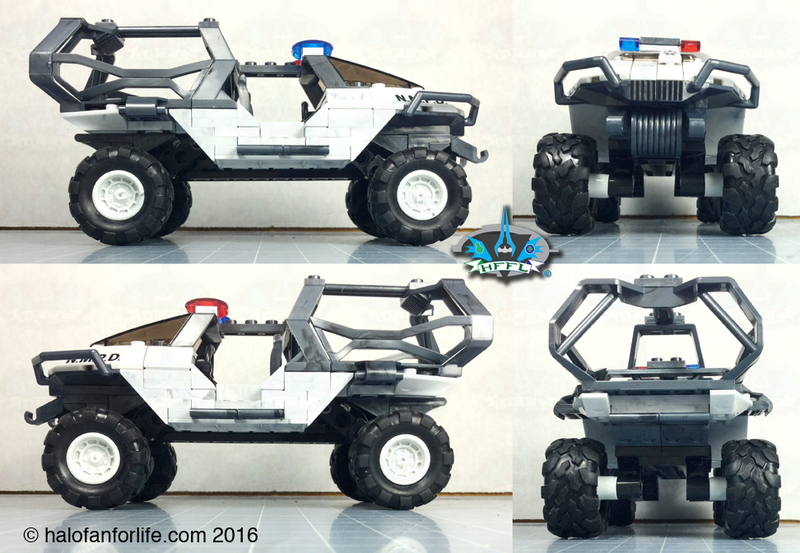 This is pretty standard for a warthog, though of course no turret here. Instead you get parts for a troop cage of sorts. The three pics above are pretty standard for warthogs. This one includes the newer independent suspension, which I LOVE. That adds a bit of bounce to EACH wheel. Note the tan camouflage bloks under the build. These are just to stabilize it as you build on top of it. I wanted to highlight the section above for two main reasons. One, no turret, obviously. The other is that this is NOT a sticker you need to put on, but is rather an appliqué by Mega. This is SO much preferred than stickers as those tend to peel off. Thanks Mega! 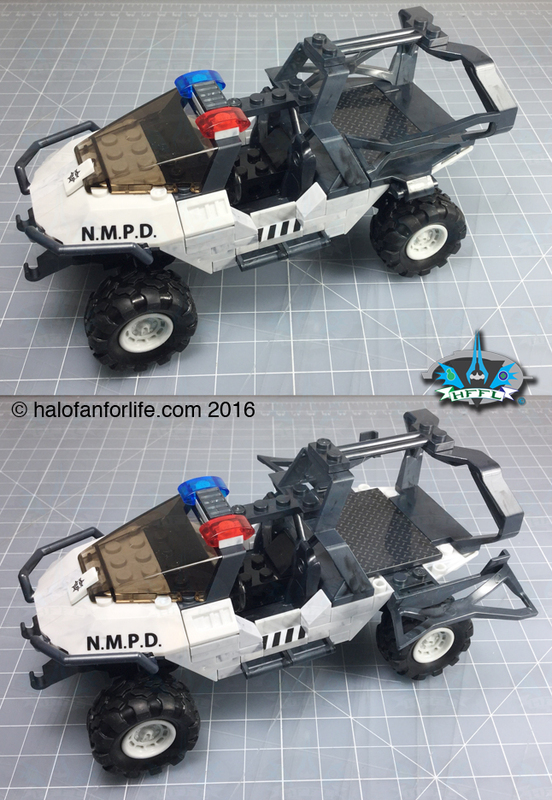 The NMPD Warthog is nearly complete. In the top portion of the graphic above, with exception to the NMPD letters, this could be an arctic warthog. 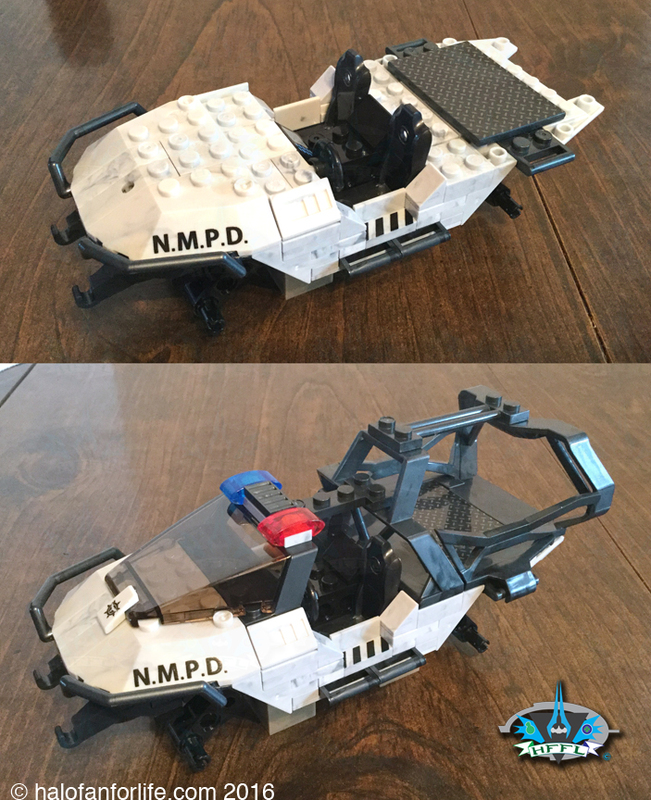 The additional red and blue lights give it just that added touch to say this is a police vehicle. Take off those tan pieces and add on the wheels and you’re done! You get 5 weapons and a jump pack with the set. 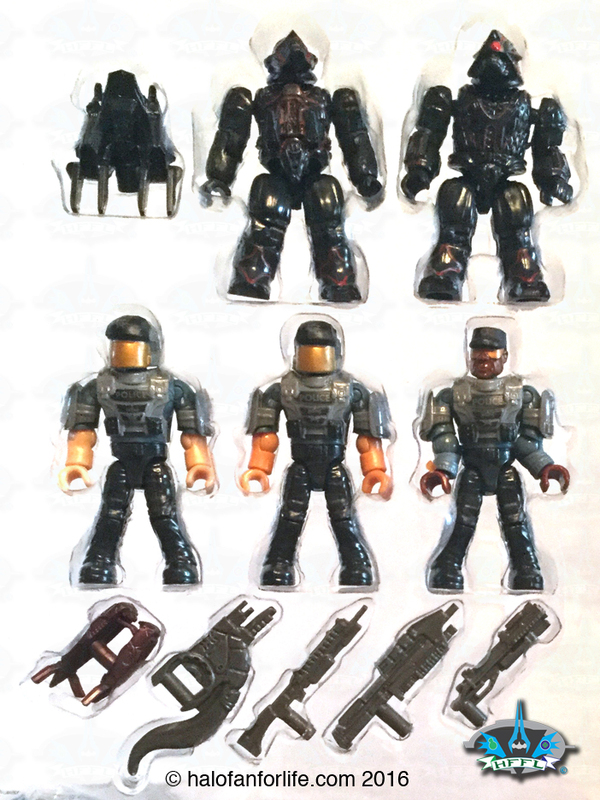 A good selection here, though the Grenade launcher wasn’t seen in Halo 3 ODST, but rather Halo Reach. Not sure why NMPD would need grenades. Well…unless they are gas grenades to disperse crowds and NOT explosive nades. Above shows the NMPD Officers. 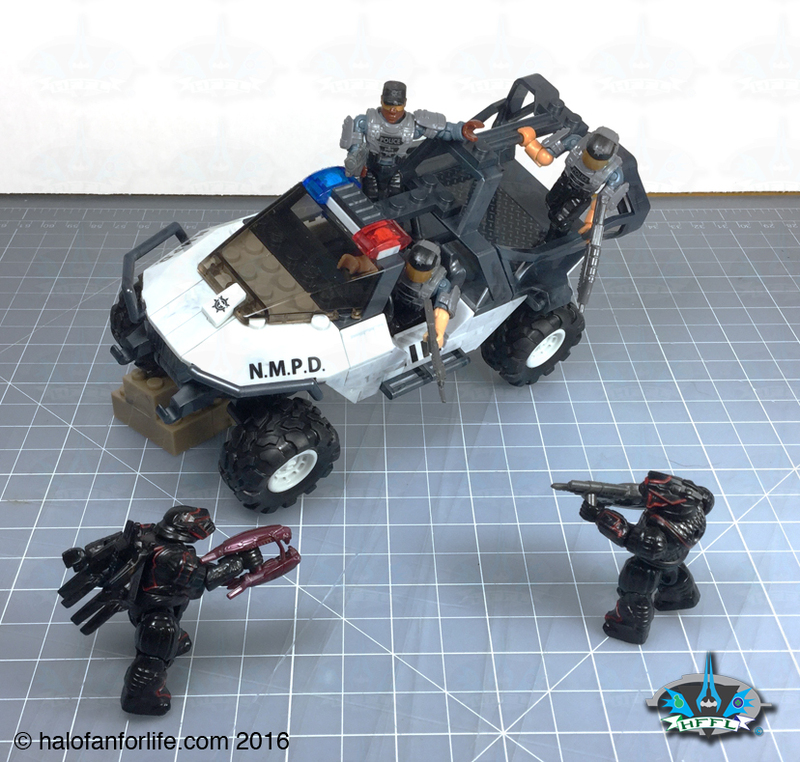 I chose to only show the middle toned one for the other views as the figures are all the same with exception to skin color and the Sgt. having glasses and a cap instead of the helmet. Here’s a close-up of the jump pack. Also note the amount of detail to it and the brute itself. Above the perspective is a tad off, but you get the idea of the orthogonal views. The back may see a bit top/back heavy. It’s not though. Those pieces are quite light and do not throw off the weight of the hog at all. Here you see how the sides of the troop cage swivel outward. Nice little extra feature. Finally, the set complete with figures. See how I used those tan bloks to prop up the hog? As mentioned, the suspension with this vehicle is great! Take note of the trooper in the back. He (and other figures) are able to hold on to the cross bar for added stability when displaying (or playing with) the set. Summary: This is a quick build. Easily done in one sitting. I had no difficulty with it at all. Instructions were easy to follow. This set has a god amount and variety of figures and weapons. • I really can’t find any faults with this set. The figure selection is appropriate for the set theme. The amount and variety of weapons is great. If I REALLY had to nit pick anything and this is a STRETCH…maybe some red/blue taillights? But it’s not needed as you clearly can tell this is a Police vehicle. Value: The price at normal retail is $25-27. It’s been found as high as $30 and as low as $17. As I mentioned at the beginning of the review, I got this online. I was tipped off by a fellow collector that this set was on sale through Walmart.com. It was being sold through a third party seller, none of we fellow collectors had heard of before. So needless to say, there was a little bit of trepidation when ordering. That all went away when I received the package intact and quickly. The, got off track a little. Okay, so at the $25 price point, this is a GREAT buy! The 5 figures account for $15 of the cost there (as normal single packed blind figures cost $3 on the average). So that leaves $10 for the Warthog. It’s MOST DEFINITELY worth that! Do I recommend it? Yes, if for no other reason than we haven’t had a troop warthog in a very long time. However, I didn’t get it just for that. 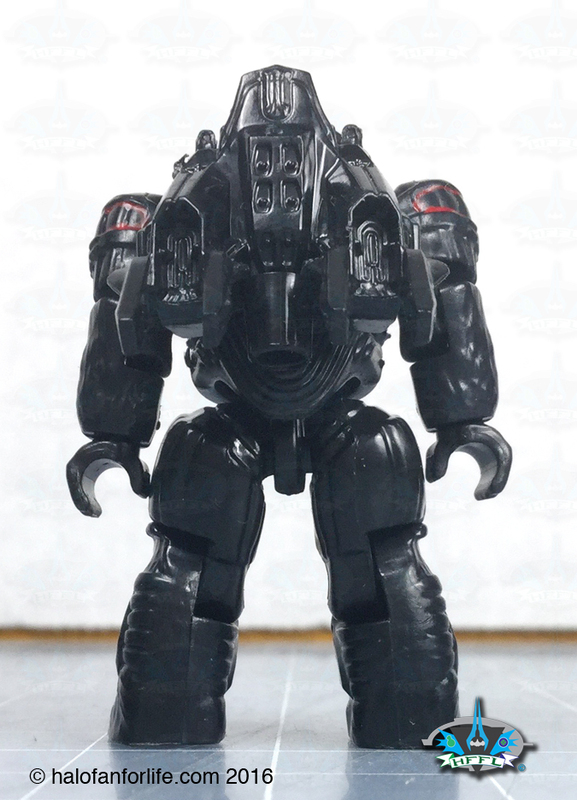 The brutes having the VISR deco was a draw for me, not to mention getting THREE NMPE troopers. Yes, definitely YES! Pick this up! 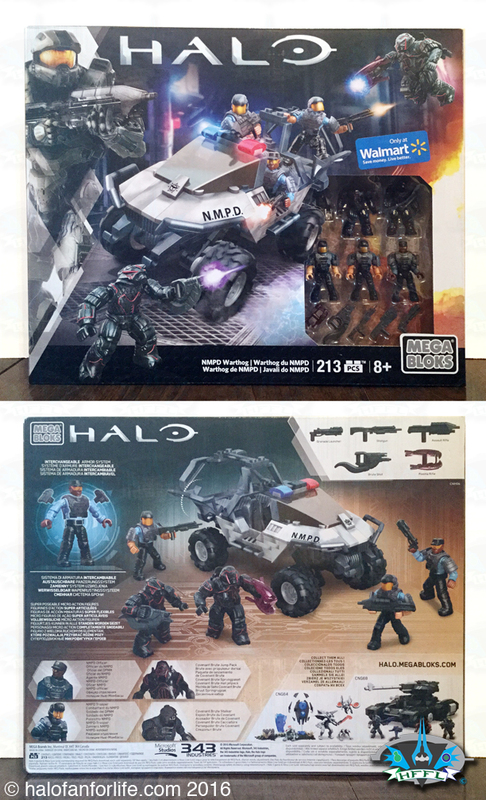 This may very well be the LAST of the NMPD sub-line from Mega, so I’d snag it up if you see it. 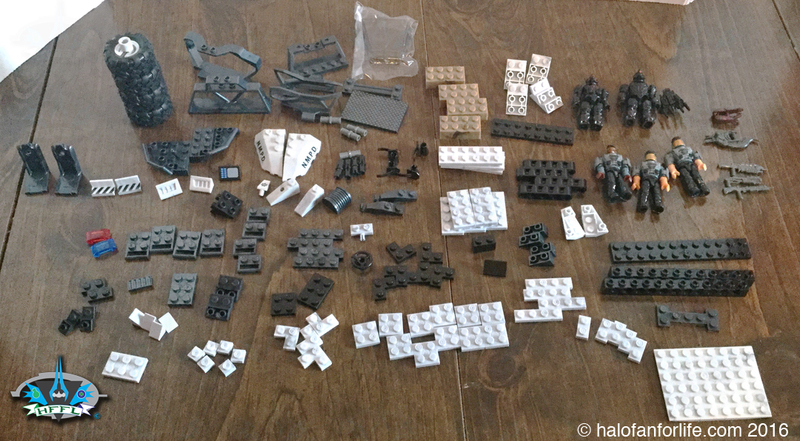 The other sets are, Cyclops, Cruiser, Hornet and a Customizer set, all reviewed here previously! 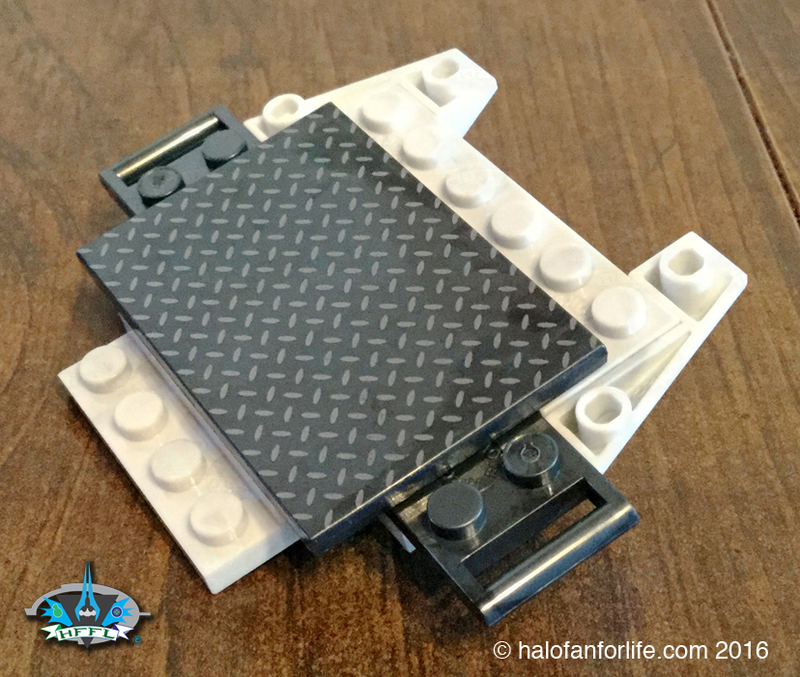 There is also an NMPD Pelican BASE…I thought I had posted my review of this here, but apparently I either deleted it or never posted it at all…YOI…I’ll put that up if I can find the pics of it…I hope I didn’t lose them as it’s a good review! If this review gives you an informed decision on whether to purchase the set or not, please consider a small donation (50 cents) maybe. It’s much appreciated and helps ensure that HFFL stays active on the internet. Thank You.